I’ve always wanted one. I’ve been eyeing this particular one for a while. I say eyeing it because I didn’t buy it straight away. I’ve been back to that shop to look at it 3 times. It cost a bit of an arm and a leg (when I compared it to others) and I couldn’t really justify the cost of it. Except that this one is made of beautiful wood – fine African hardwood and anodised aluminium and the sound is very, very pretty. 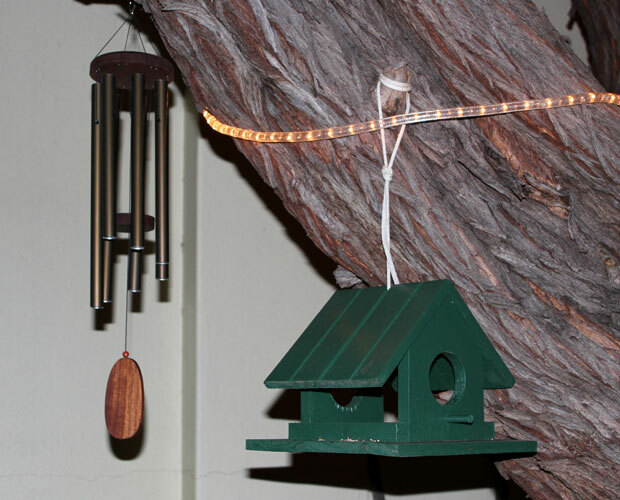 It seems to play a tune and according to the little label that came with it, this wind chime is “toned to the balanced, melodious sound of the C major scale, creating light and happy tunes“. But it is pretty, No? Christine, Like you, I ADORE wind chimes and my guess is that I would be madly in love with yours. (As a musician, I can appreciate the fact that it is tuned to the C major scale LOL). Hang that thing where you can enjoy it! It is pretty. I haven’t had one in the last two gardens. The first wind chime I had drove me crazy during a powerful wind storm one year, and was boxed, at about 2AM…never again saw the light of day They do sound lovely in gentle breezes though! Hopefully your critters will adjust to it, and your daughter will come to like it too. My son doesn’t like when the north wind blows and the chimes start to really ‘sing’ but I confess to really loving the sound. It’s always a welcome sound to know some ‘weather’ is coming! I hope everyone grows to love them as you do! hi christine! i LOVE wind chimes. we’ve got 3 small ones here…i love the sound they make..yours are so lovely. have a great day! Oh, my! What responses! I love wind chimes, though mine always break. I think they are a bit expensive, too, but I would love a beautiful one. I agree that the sound is important! I hope you enjoy it singing in the wind. Ours is very large, bamboo, and gets wrapped up to sleep at night. Thinking about it, we often forget to wake it up in the morning – but I enjoy the sound! And yours and mine, both look good. That is so funny. When I get the comment it’s not my favorite I know I have not succeeded with the family. 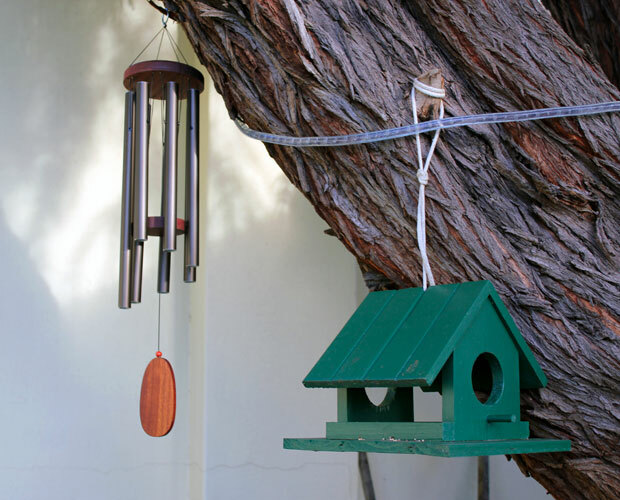 wind chimes have been voted in the top ten of pet hates along with trampolines but I like them. The sound issuing in a light breeze is a charming melody though can become tin-can scary in strong winds. Glad you treated yourself! Isn’t it funny how you can see one thing and those around you can see something completely different. I have a similar wind chime and like the sound it makes. I never thought of this before, but your daughter is right. I have seen wind chimes used in horror movies as an ominous warning of something bad to come. I guess there is something ‘haunting’ in the sound they make. So funny that the family all have different opinions!! My friend – I LOVE chimes too. They are good around the home and they bring good energy and disperse bad or stuck energies. I have a bamboo one, a very woody tone and only chimes when the North wind blows – when the rain is approaching! I remember my folks putting a rubber band around theirs when it got stormy because it can get damaged and can be very noisy! Something to remember. Wind chimes are pretty in a garden, but not always welcomed. I had mine for quite a while, but they seemed to scare off the birds visiting. Having such a small yard, there was no where to move it that suited the birds. Hi Donna – I only thought of the birds when it came to setting it up. So far, so good – they are all here again today and chirping happily, but there is no real breeze, so very little sound coming from it today. If they don’t like it it might have to move indoors. Birds first … it is after all their “space”. Can’t say I love it … but I know you do, so trying to be positive. But don’t complain on scary, stormy nights when I get freaked out and think an axe murderer is trying to break into the house! LOL! Ok, I might have to rethink its position.